Flood damage in any car could leave you with a big bill and a few days without a vehicle while it’s being worked on. If you’re not a trained mechanic and your vehicle’s still within its warranty period, you should get it looked at by a professional. But, if you need to find out how to repair a flooded diesel engine yourself, the following should be helpful. 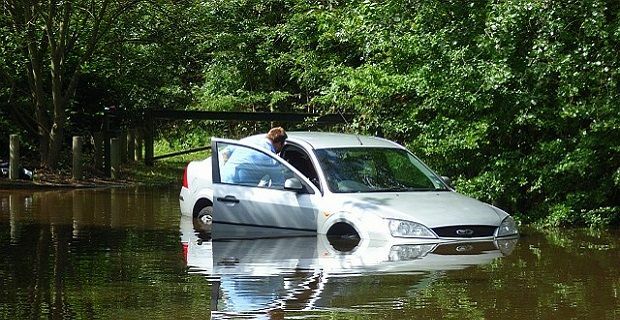 Any flood-affected engine will be worse off if you attempt to start it. It won’t start when it’s flooded anyway, so there’s no point in attempting it. At this point you should disconnect the battery terminal and check the oil for discoloration. If the water level was high enough, you will find water mixed in with the oil. As oil floats on water, looking into the oil tank won’t tell you anything so you should check with the dip stick. If there’s water in with the oil, you’ll need to drain it, change the filters and the then change the oil. There may well be water in with the fuel. If that’s the case, then you’ll have more work to do to remove it. You’ll have to remove the spark plugs and then turn the engine over by hand to remove any excess water in the cylinders. Check the air filters for water before you move onto the next step. If you vehicle’s engine has a cam belt, you’ll need to make sure that there is no debris inside the belt’s covers before you do anything else. If the cam belt becomes derailed, it could cause the engine to grenade itself without much warning to the driver. At this point you can start the engine. This will help with the drying process and confirm that you’ve done everything correctly. cars engine - all you need to know for happy motoring!